Pošto se Nokia 5800xm i zvanično pojavila "u Srba" (-LINK-), tema za nju i za "samo što nije" Nokiu N97. Worldmate v6.50.29 S60v5 Free version. What's Free: Weathercaster voice-animated weather service, Weather forecasts for cites across the globe, World Clocks, Currency Converter and exchange rates, World Day/Night Map. već samo opisi programa i slike istih. Nemamo toliko vremena da svaki link proveravamo i editujemo postove zbog brisanja linkova. Oni koji budu kršili ovo upozorenje biće udaljeni sa foruma. InternetTabletVideoConverter0.32, it's available for both Windows and Mac, it's totally free, and should work with all current S60 devices despite its Linux tablet heritage. It seems to work especially well with the Nokia 5800 as it has the same 16:9 screen shape as the tablets, and a somewhat similar resolution too. The Tablet Converter was written for Nokia's internet tablets, and isn't officially intended for Symbian devices at all, but in the real world it seems to work fine with S60 and is much easier to use than the official application. * Real-time incoming number analysis. When you have an incoming call BlackList application instantly detects the incoming number and uses unique algorithm (reverted binary tree) to analyse it and determine if the service has to reject it or not. Regardless of how many numbers/contacts it has to analyse it rejects the call if needed in some microseconds, before your phone starts ringing and disturbs you. * Just busy. Because of real-time number analysis and almost instant call reject all unwanted callers won't even know that they are blacklisted, they will just hear the busy tone all the time. * Sms notifier. You can set up blacklist to send sms to rejected person if needed in order to explain your reject reason, e.g. &quot;I'm on business conference, call you back later&quot;. * Scheduler. 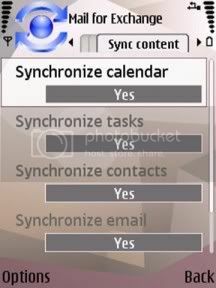 Scheduler makes BlackList your completely automated personal secretary. The service can reject everyone except family member at night, accept only co-workers at business hours on working days, etc. * Real interaction with built-in contacts. When you set up your black lists you can add here contacts from your contact book (not just import phone numbers!) and even more you can insert here groups of contacts. Just create in your built-in contacts application some groups like Family, Spammers, Co-workers, etc and add these groups to as many lists as you need without adding tons of contacts to every list. * Service based application. BlackList is a professionally made application and consists of configuration application that you can start like any other application and service module (always-in-memory process). When you have configured the settings you can activate the service and close the configuration application. The service will do all job using really small amount of memory, system resources and absolutely transparent to user. 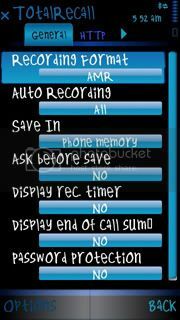 Just configure and turn it on one time and you can forget about it and forget about all unwanted callers as well. - Empty "white list" - will reject all incoming calls. - Empty "black list" - will accept all calls. When you finish setup you can turn the service ON to start filtering all incoming calls. When the service is ON BlackList configuration application is no longer needed and you can close it in order not to waste the memory and resources, the service will stay in memory and will do all job. When the service is activated you can see the brief status of its activity in application status line. Like "Rejected 3 / 4" - means 3 calls have been automatically rejected from 4 total incoming calls. Please note: service activating could take some time (some seconds) as it has to prepare and organise all your data (fetch all phone numbers from listed contacts/groups of contacts, etc) to be able to analyse incoming phone number during a call in real time. Imagine the situation you are on business conference and want to accept some "work" calls only and don't want to be disturbed with the rest of calls. But you don't want to lose them! 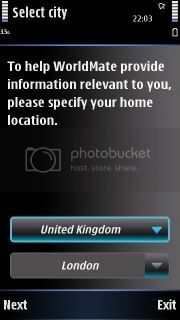 You can manage such situation easily with BlackList application. Just set up BlackList to accept needed calls only and use Phone built in "Call divert" options. To reach "Call divert" options, please start the system application "Settings" and select "Call divert" item here. This command allows you to configure Call forwarding service of your network operator directly from the application. Turn "Divert if busy" ON and set up here your secretary/voice mail/etc phone number and your network operator will automatically forward callers rejected by BlackList application to the specified number. You can always take a look what numbers were rejected by the application. To see rejected calls log select "View log" command from menu. Here you will be able to see all such calls sorted by time and call back the rejected caller from this view. 1. When a blacklisted call comes in it goes to my voice mail. Can it just be rejected only? * Yes. If rejected call goes to voice mail it means your network provider re-directs the caller to your voice mail when receiving busy signal from your phone . Some providers set this behaviour on default when you buy a phone. But you can change this behaviour directly from your phone: Start system application "Settings" and select "Call divert" command here. Select "If busy" item and than cancel divert command. Silence. At last! No more unwanted calls. 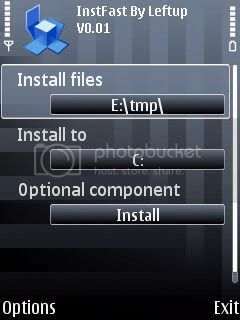 SymTorrent is the first full-featured and currently only available BitTorrent client for devices based on the S60 platform. It supports downloading multiple torrents at the same time, is capable of both downloading and uploading and can save the status of your unfinished torrents, so you can resume the downloads after restarting the application. carov, sa Nokia.com ne možeš jer ne postoji podrška za 5800. Probaj da uradiš soft reset (*#7370#) trebalo bi da vrati maps u normalu. Ako to ne pomogne, a baš želiš Nokia Maps (ne vidim zašto? ), daću ti na PP link za hard reset ali je "at your own risk". Accuweather: This is a weather app which provides users with weather information for global locations including current conditions, 4-day forecasts, radar or satellite images, 15-day calendar view for a quick check of upcoming weather, hourly forecasts in graph format for visual display of temperature and conditions, and severe weather alerts (US only). 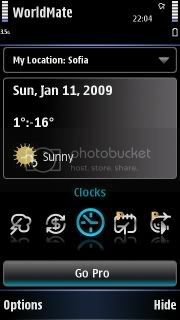 Download AccuWeather: The widget is free for you to download straight from your Nokia 5800’s download icon, so go ahead and get it for a great weather forecast experience. Mail for Exchange: This is Nokia’s push email service and a serious BlackBerry beater on E-Series Nokia handsets, and the message maestro is supported now on the 5800 too. Now you’ll know instantly when your boss wants that report done, even when you’re in bed. And maybe some good news on occasion too. jesam uradio restart i standarne aplikacije koje su na phonu rade extra nego kazem ove koje sam probao pokrenu se ali izidje prozorcic u komu pise "this application can only work with indan sim card." i onda izbaci..
PhotoFlow, from Scalado, is a piece of software that can be used to view, and zoom-in on, images stored on the phone...is available as a free download for the Nokia 5800 XpressMusic. You can get it from the Download! application and you will find it in the Imaging sub-folder. 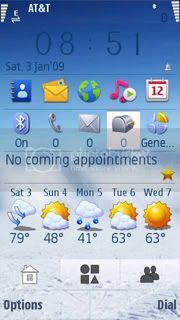 Accuweather widget je must have widget za vlasnike 5800! Da li je neko koristio Smart Movie na Nokia 5800? Da li seckaju filmovi konvertovani sa Smart Movie Converter-om (pročitao na jednom mestu pa me to zanima iz još nečijeg iskustva) ? ShakeSMS:otvara pristigli SMS trešenjem telefona.